HEIR Lab (Humanoid Engineering & Intelligent Robotics), at Marquette University took their robot to RoboCup 2015 in Hefei, China! The team is lead by Andrew B. Williams, Ph.D., who has written up a fantastic post on the subject. This week, our students in the Marquette University Humanoid Engineering & Intelligent Robotics (HEIR) Lab are participating in perhaps the largest and the oldest robot hackathon in the world, RoboCup, in Hefei, China. 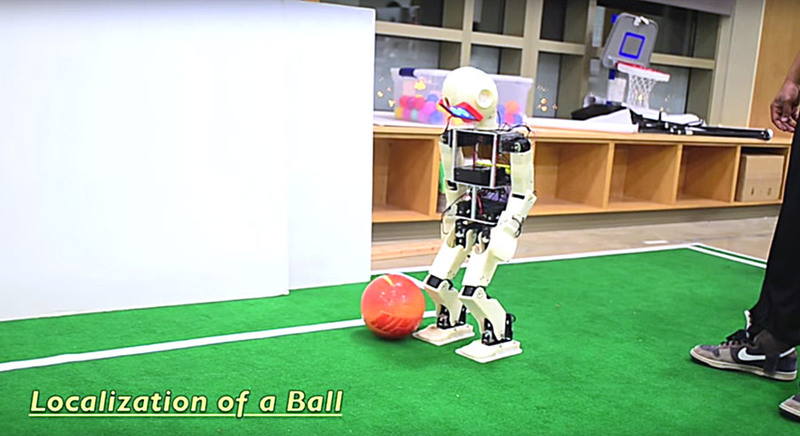 RoboCup is sometimes referred to as the World Cup of robotics and artificial intelligence. This is the tenth anniversary since I founded and led the Spelman College SpelBots to our first RoboCup in Osaka, Japan and it is a privilege to lead our current, outstanding team from Marquette University College of Engineering: Matt, Adrianna, Ryan, and Sally. For the rest of the post, check out his blog, and make sure to watch their Qualification video from RoboCup 2014 below! This entry was posted on Wednesday, August 5th, 2015 at 10:40 am	and is filed under Competitions / Contests, Featured Projects / Robots. You can follow any responses to this entry through the RSS 2.0 feed. You can leave a response, or trackback from your own site.